Green Cotton Boulder Mattress without Fire Retardant - This mattress is the firmest we make! Made of 100% US Grown Green Cotton and it comes in 3-inch thickness. You can order the stowaway with or without a cover. 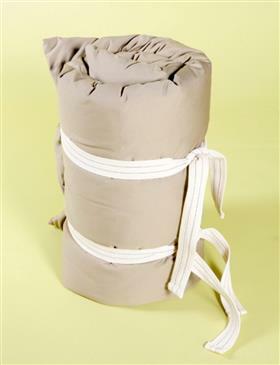 The cover has straps sewn right on it so you can roll it up for easy storage. Click here to review natural and organic COVER options. This stowaway is the firmest we make. The surface is flat, firm, and very supportive. The Boulder Cotton stowaway is handmade in the same style as the firm mattresses that have been made for centuries in India and Japan. A favorite with our European customers since it is made in similar styles as made in those countries for centuries.